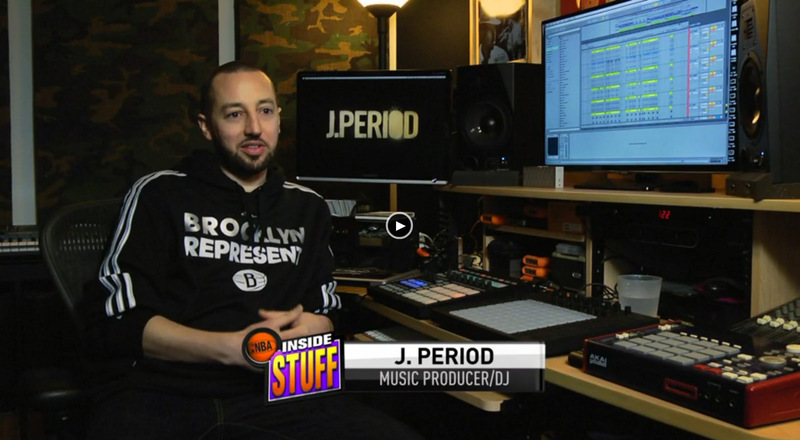 Brooklyn, NY (Febraury 14, 2015) - Celebrating NBA ALL-STAR WEEKEND’S 2015 takeover of New York City, NBA Inside Stuff journeys to J.PERIOD’S Brooklyn recording studio for a discussion of J.PERIOD’s work for the Brooklyn Nets, producing original music for the NBA, and a behind-the-scenes look at the 2015 NBA Inside Stuff theme song, produced by J.PERIOD and featuring James Poyser of The Roots. With Brooklyn as the backdrop for All-Star Saturday Night, hosts Grant Hill and Kristen Ledlow discuss what makes the borough so unique, and why J.PERIOD’s signature style makes for the perfect Brooklyn soundtrack. Also look out for a special appearance from talented new MC Dayne Jordan! CLICK TO WATCH ON NBA.COM! !